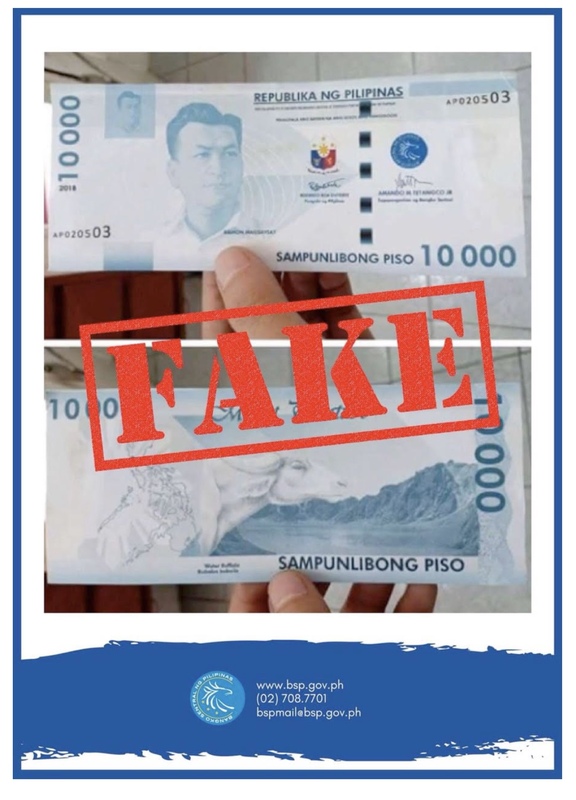 The Bangko Sentral ng Pilipinas has issued an advisory on June 23 against fictitious 10,000-Piso Banknote, advising the public to immediately report to the nearest police station or the National Bureau of Investigation if they have seen one being used. It didn’t explain what prompted the advisory but the issuance of the advisory on a Saturday suggests some degree of urgency. The advisory included an image of the fake 10,000-Piso Banknote. The monetary authority said that the New Generation Currency (NGC) Banknote Series currently in circulation is comprised of six denominations only. These are: 1000-, 500-, 200-, 100-, 50- and 20-Piso banknotes. The BSP stressed it has neither produced nor issued a 10,000-Piso NGC banknote.